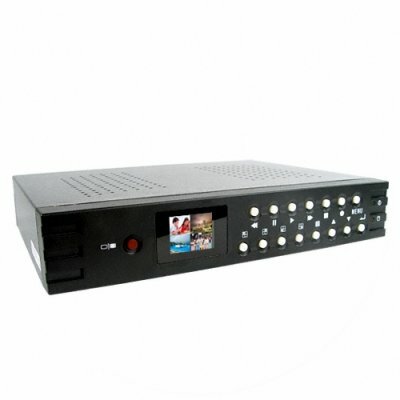 Successfully Added Four Channel Embedded Digital Video Recorder -PAL to your Shopping Cart. If you're after the highest standards in DVR equipment to look after assets or family then here it is, an excellent 4 channel DVR with Preview LCD, internal HDD capability and USB connectivity. You'll be impressed from the get-go after you simply install your own 3.5 inch HDD (up to 200GB), and easily connect your cameras. From here this unit switches into top gear, with dual monitor ouputs, an s-video output (ideal for a TV), sensor inputs and an alarm output. Recording is possible on all channels simultaneously and in a number of different profiles so you can go all out for quality or step the resolution and frame rate down a bit for maximum recording times. All these features packed into a small, actively cooled (50mm fan) rugged steel enclosure. A powerful and but discreet product and an all-time great seller get yours today from Chinavasion at great wholesale prices. Note: This unit does not come with a hard disk drive you will need to purchase this separately. Stand-Alone Operation not effected by PC Viruses etc.